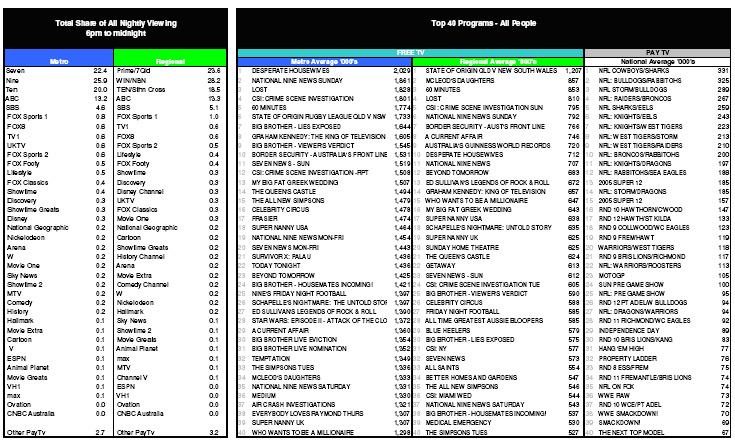 I knew channel 7 would win Sunday night, such a strong line up – the other networks will have to knuckle down & kick back. 9 needs to get strong interesting stories for 60 Minutes (what about the Corby scandal?? ), 10 needs to ditch the dog show & maybe invest in a local version of Do You Think You Can Dance, we have so many fantastic dancers in this country – this could work! In the short term, bring back Jamie & his cooking shows maybe, they always seem to rate well. The interesting decider will be the weeks ahead, will Ugly Betty sustain those high fugures?